France has had many monarchs, and many republics, since the revolution of 1789, yet the events of that year and those that followed still capture the popular imagination. The effects on France were enormous, not the least of which was to pave the way for a young artillery officer to become the most powerful man in Europe. While this set is entitled 'French Revolution', its focus is clearly the guillotine, a device which played no part in the early years of the revolution itself, contrary to popular belief. Although decapitation machines had been around for centuries, such a device was only suggested to the French Assembly in October 1789, designed in 1791 and first used in April 1792. Over 15,000 people, from kings to thieves, were to die in this way over the next few years however, making it an enduring icon of the revolution. 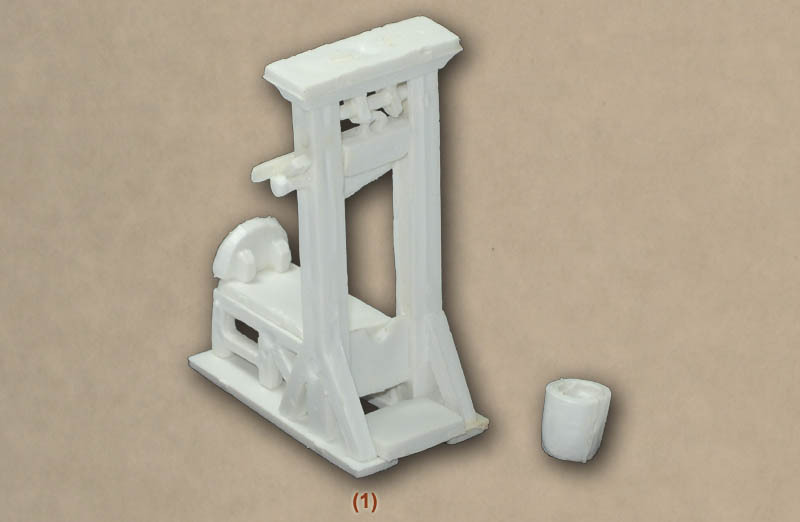 The design of guillotine that was adopted is well represented by this model. Inevitably it does not include the pulleys and other fine details, but overall it is pretty accurate. However the same cannot be said for the build quality. The pieces are of a good hard plastic which takes glue well, but there is a fair amount of flash, and the tolerances are not good, so parts are not quite square or fit together quite vaguely. Several parts have pegs and holes, and in all cases these pegs are far too large for the holes, and sometimes misaligned. We recommend cutting all pegs off. The whole article will fit together, given time and patience, but the result is quite rough, though no doubt this could be improved in suitably skilled hands. Our picture shows the model largely as it comes, and it assembles to a height of 56mm (4 metres), which is correct. Also there are 23 pieces to the guillotine, yet there are no instructions, nor even a picture as a guide. The Odemars website contains several good photos of the model, and is invaluable in assembling the piece, but no consideration has been given to those without access to the Internet. If the guillotine is a modelling challenge then the figures are a welcome relief. All seem to accompany the device, and include officials, National Guard, and a number of victims. Odemars say that the headless corpse is non other than King Louis XVI himself (executed 21 Jan 1793), and the woman with her head in her hands is his famous wife Marie Antoinette (executed 16 October 1793). The executioner, holding aloft the King's freshly severed head, is Charles-Henry Sanson, the man who could claim 2,917 other victims besides the King. The costumes and uniforms are all correctly done, and are a good reflection of the common styles of the day. Inevitably all the figures are pretty static, with the executioner providing most of the drama. As is common with this company, the figures are quite flat, and sculpting is adequate rather than great. Occasionally some detail is missing such as the back of the straps on one of the guards, but at least there is little flash. All told an interesting set. The guillotine will require a lot of work, but at least it is a job done just once - who needs multiple guillotines? The figures are better, and most have further uses beyond the execution scene. Another in the growing line of non-military historical sets, and a welcome one.